It’s hard to believe we are less than a week from the Society for News Design annual workshop in Charlotte, N.C. We want to share a few tips for when you arrive in the Queen City. 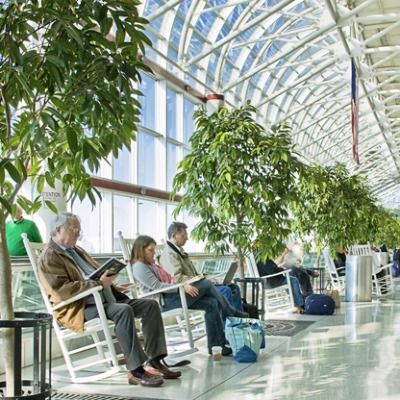 After relaxing in one of the famed rocking chairs at Charlotte Douglas International, the easiest way to get to the Sheraton Hotel at 555 S. McDowell St. — or anywhere in Uptown (we call downtown Uptown in Charlotte) — is by cab. There’s a $25 flat rate from the airport to Uptown. You also can use Uber or Lyft, with pickup at Zone D in the Arrivals area for ride-sharing services. You can pick up your workshop badge outside the Carolina Ballroom, located through the main lobby of the Sheraton Hotel. You need your badge to get into all SND Charlotte events, including the Opening Reception (and all Hands-On sessions in particular). Badge pick up starts at 7:30 a.m. Wednesday and continues through 7 p.m. The desk will reopen again on Thursday morning at 8 a.m. The SND Charlotte party officially kicks off with the Opening Reception, sponsored by Alley Interactive and Advance Local, at the U.S. National Whitewater Center on Wednesday at 6 p.m. Buses to USNWC will begin departing the Sheraton at 5 p.m. on 15-minute intervals (you can also drive and park if you prefer). SND Charlotte will provide passed appetizers, one complimentary drink, and the band Yacht Rock will perform at the Whitewater Center. Please have your badge with you, or an ID, to get into the venue. Everyone has received an email invite to our workshop schedule app, which is powered by Sched.com. You can also visit sndclt2017.sched.com to create your schedule, leave feedback about sessions, and sign up for seat-limited sessions. If you did not receive an invite to Sched, check your spam/junk/clutter folder. If you still don’t have an invite, email Jon/Steve/Kyle for help. Grits with Gurus: There are still spots available to have breakfast and a great conversation with a design all-star on Thursday or Friday morning. Silent Auction, sponsored by Hoefler& Co.: This SND workshop tradition benefits the SND Foundation, which awards travel grants and scholarships to students. Please think about bringing an item to donate, and some cash to bid. Fun Run: Bring your sneakers for a quick jog, or a longer run, through Charlotte’s greenway on Saturday morning at 8 a.m.
Not attending the workshop this year? Follow along at home. Our student newsroom will be providing coverage of every session. Follow coverage on social media #sndclt. Now you get free tutorial about how to hide taskbar online.